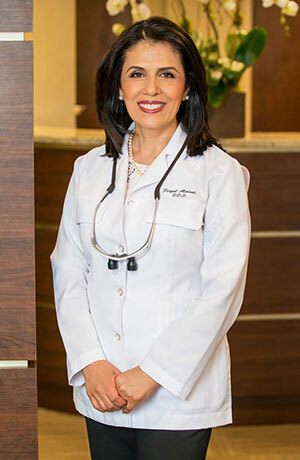 Dr. Feryal Alidadi has provided comprehensive family and cosmetic dental services to the Port Chester, White Plains and Westchester County area residents for over 20 years. She delivers her special brand of dental care with a gentle touch, a friendly smile and a kind heart. Dr. Alidadi is committed to offering each of her patients the finest possible care that she and modern dentistry can provide. She wants your smile to be the best it can be, while ensuring your good oral health. Dr. Alidadi emphasizes patient comfort, as well as staying current with the latest advancements in dentistry. She has a wide range of experience in different areas of dentistry, from cosmetic and restorative dentistry to root canal therapy and surgical treatments. Her approach to your treatment begins with patiently listening to you discuss your dental concerns and goals, and then answering any questions you may have. After a complete and thorough exam, she’ll discuss her diagnosis and recommended treatment options with you. Dr. Alidadi strives to be the best dentist in her area. She graduated from the highly respected New York University Dental School in 1992. Since receiving her DDS degree, she has been through several post graduate courses in different fields of dentistry at well-respected dental learning institutions. These include the world-renowned Pankey Institute and Spear® Education. She is an active member in good standing of the American Dental Association, the American Academy of Cosmetic Dentistry, the Academy Of General Dentistry, the New York State Dental Association and the Ninth District Dental Association.